At last it is over. A terrible waste of 10 decent, productive human lives taken by the lowest life forms among us: Those who do evil just to be evil. Realize that what you read below has not been updated since the arrests. I am not involved in the investigation and I do not know any specific data on this case -- other than what I read in the papers and see on TV. Everything you read here is subject to change as more actual information about the case becomes available. Shown above is a commonly available type of .223 (or 5.56x45mm) ammunition. The bullet is a 55 grain (3.6gm) Full Metal Jacket (FMJ) type with a muzzle velocity of approx 3,300 f/s (feet per second). There are many different other bullet types (soft point, hollow point, etc). The particular type of ammunition used by the shooter has not been (to my knowledge) publicly announced. I am sure that the case investigators do know the exact bullet type used and the brand(s) of ammunition. This information would be revealed by an examination of the recovered bullets or bullet fragments and the cartridge casing(s). If you don't know about these things; the bullet leaves the gun but the cartridge casing either stays inside the gun (with a bolt-action rifle) or is ejected several feet or so away from the firearm (with a semi-auto firearm). The .223 bullet is very light (equivalent in weight to about 1 1/2 dimes) and very fast. The high velocity allows for easy aiming as the bullet trajectory is relatively flat. The low mass of the bullet provides a light recoil which makes a .223 rifle easy to shoot accurately. We apparently don't yet know the type of weapon used. The report about the "AK-74" turned out to be phony. There are many weapons which will fire the .223 cartridge and within those weapons, there are many variants which may use the same or similar internal parts. I believe the investigators do have an idea of the actual weapon used -- I don't know why this information is not being released. There may be a good reason but after hearing ATF official Michael R. Bouchard stating that they are looking for any weapon "in the 22 caliber family . . . " He continued to describe this "family" as including ".221, .222 and .223 calibers." This is a very strange statement -- particularly when made by someone expected to have adequate technical knowledge to know the differences among those very different calibers. The empty cartridge case(s) currently in police custody should show conclusively which type of ammunition was used (see below). It seems to me that to talk about .221 and .222 calibers, he is further confusing things -- as those cartridges are NOT the same as .223 and they cannot be fired in a .223 weapon. I suspect that ATF Agent Bouchard was chosen to speak publicly at the press conference because of his rank -- not because of his technical knowledge of ballistics. Most of the .223 firearms available are rifles but there are relatively uncommon handguns which fire the same cartridge. These "XP" or "Contender" handguns are highly accurate and are usually equipped with scopes for long-range target shooting. Such a firearm would be very "practical" for shooting from inside a car. Wingert claimed that the sniper must be using a "flash suppressant." Greta, who obviously knows nothing about firearms but does not pretend to, asked the Newsweek reporter how much it would cost to buy a "flash suppressant" and a "silencer." The Newsweek reporter said, "You can buy them on the internet for less than $30." What she was referring to is a flash suppressor which are found on most assault rifles. A flash suppressor is not a "silencer" and only provides minimal diminution of the muzzle flash of a firearm. During daytime hours, a muzzle flash is almost invisible -- with or without a flash suppressor. At night, the muzzle flash is visible but it only lasts for a fraction of a second. It does not matter if the sniper's weapon is equipped with a flash suppressor or not: in the daytime a muzzle flash is not visible and at night it is visible -- with or without a flash suppressor. Silencers, by the way, are highly illegal and not obtainable on the internet. Much data can be discerned from an examination of the empty cartridge case which can lead to the identification or "match" of the cartridge case to a particular firearm. When a cartridge is chambered, fired, and ejected, parts of the firearm come in contact with the brass cartridge case and leave impressions which can be individually identified to a particular firearm. But this data cannot currently be used to locate or identify the shooter. There are several states that require "ballistic fingerprinting" of firearms sold but they presently only include handguns, not rifles. The projectiles recovered from the victim's bodies are likely not to be intact bullets. An FMJ .223 bullet will often fragment inside the body; Soft and hollow-point bullets will deform and may also fragment severely. Because of the difficulty inherent in working with deformed fragments, it is likely that the bullet evidence in some of the shooting incidents will not be sufficient to identify to any firearm. The surgeon who operated on the Ponderosa Steakhouse victim described the bullet's destructive effect on the victim's body. He said some of the damage was done by the bullet fragments " . . after it exploded." The bullet did not explode. There is a dynamic which occurs with many .223 bullet types: After going through a few inches of soft tissue, the bullet will yaw (turn sideways instead of point-forward. This causes tremendous drag forces to act upon the small bullet. The bullet will break up into smaller pieces and some of the fragments will fly off into other areas distant from the initial wound track. Those fragments make small holes in organs and other soft tissue which weakens their structural integrity. A temporary cavity is then formed (like a splash bubble) stretching the weakened tissue which often comes apart. This phenomenon only occurs for a few thousands of a second. While such .223 bullets are not "explosive bullets," their performance can resemble an "explosion." Cartridge Case Found in Rental Truck? Current news reports (19 Oct) state that an empty cartridge case was found in a returned rental box-type truck. No further information has been released. This cartridge case -- if it is of the same caliber and type used by the shooter -- could be extremely important. If the truck was rented, there is considerable paperwork associated with the rental. What is difficult to understand is why the most important detail about this cartridge has not been released: Is it a .223 case? That would require about two seconds to determine. No matter what, I believe it was a gross error to announce that this cartridge case was found. If the case does belong to the shooter, imagine what is reaction would be when he heard the news reports: "Geez, I left a cartridge case in the truck?" He would realize that the police would soon be knocking on his door. I would think he would immediately leave the area. Latest press reports now describe the cartridge case as a .308 caliber. -- which is very different from a .223 and very easy to distinguish (see above.) -- NOTE: The Washington Post made this false report. Be very careful about what you "learn" from the news media. AK-74 . . . ? ---- PHONY!! Fox News reported many times that one witness (now discredited) in the Home Depot shooting insisted that the weapon used was an "AK-74, not an AK-47." It is difficult to believe that someone several dozen yards away could identify the difference between the two weapons. The 74 is a later model of the 47 and the visual differences between them are very subtle. Either weapon could have been used because variants of both are available in this country in the .223 caliber but they are relatively rare -- especially the AK-74. One analytical technique I often use may have an application in this case. This can only be performed if there is sufficient data (I do not know about the actualforensic data in this case.) What you see here is only an example; it is not one of the crime scenes nor does it show data from an actual victim. 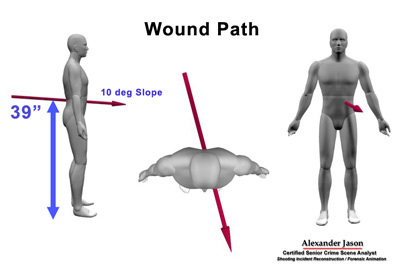 In some cases, a good autopsy can describe the bullet's path through the body sufficiently to establish a wound path. When the entry and exit wounds (if there is an exit) are located and measured, all this data may allow a determination of the horizontal and vertical angle through the body. Should the Investigation Be Taken Over by the FBI ? Don't pay attention to the babbling commentators who seem to be fixated on this point. First of all, in a critical case like this, it doesn't matter who has the title of "In Charge" -- I'm sure that everything that can be done is being done. If the FBI has an idea on how to proceed, they are free to pursue it. There are more than 500 FBI agents working right now. Do you think there would suddenly be more if the FBI announced it was taking over . . ? And . . . I strongly suspect that the FBI is already in charge. But they don't want to this to be known because the sniper appears to have some sort of desire to communicate with Chief Moose -- who has now become the Task Force's "front man." It is best to leave a "friendly face" as the potential point of contact -- much preferable to some new, cold, bureaucratic FBI Special Agent in Charge. Is the Shooter Military or Law Enforcement Trained? He could be but formal marksmanship training is not required. A few boxes of ammo on the shooting range could prepare someone to use a rifle with basic competence. If the shooter is using a telescopic sight, it is quite easy to strike an unsuspecting person 100 yards or so distant. Is This the Work of Two (or more) People -- Perhaps Terrorists? I don't think so. I believe this is more likely the work of a single "maniac" type shooter who has is personal "reasons" for what he is doing. He simply has to do what he is doing; he really doesn't have a choice. This is just my opinion, not a conclusion. The assertions by some commentators that the shootings must be the work of two or more people are not justified. Yes, if you were planning a military sniping operation, you would utilize more than one person. But the evidence so far is consistent with a criminal -- not military -- operation. There could be two or more people but the fact is that all the shootings could be done by one person, acting alone. Is the Shooter a Highly Skilled Shooter? Perhaps but it is important to realize that just because he shot some victims in the head, that does not mean he was AIMING for the head -- and the head shots could have been "missed" center-of-mass (chest) shots. The shot into the Michael's Art Store window was, I believe, likely to be a missed shot. He was probably aiming at a person. Long range shots are more difficult than short range shots. I've heard much chatter about the range for some of his shots but unless we know the actualdistance of each shot fired, it is difficult to make a judgment on his level of skill with a firearm. Is the Shooter a Master Criminal Type or Just Lucky? The sniper is more than your average dumb criminal or average drooling maniac but . . . it does not require a "master criminal" to find a place to shoot, fire a shot, and drive away. From what I know, his success does require some competence as well as a some darn good luck. How Is It Possible That the Police Can't Catch The Sniper? You have to realize that in the real world most crimes are never solved. Most people have been heavily influenced by their limited view of law enforcement and "crime solving" into believing that all crimes are solvable. On TV and in the movies, all crimes are solved; generally in 30 or 60 minutes. Even the excellent forensic files type shows never feature cases which end with an unsolved crime. If a crime is committed and there are no witnesses, no physical evidence is left at the scene, and there is no connection between the victim and the criminal; it is highly unlikely that the crime would be solved. That is the reality of crime and crime solving. Isn't There an Absurdly High Number of "Former FBI Profilers" Around? Someone engaged in the scientific study of crime as a social phenomenon, of criminals and of penal treatment. Who Does This: Usually a college professor type concerned with statistical aspects of crime While there are rare exceptions, a criminologist is not trained nor experienced in aspects of forensic science or in techniques of "solving crime" or "catching criminals." Someone engaged in the application of scientific techniques in collecting and analyzing physical evidence in criminal cases and other forensic matters. Who Does This: A forensic scientist who works at collecting and or analyzing physical evidence. Some are specialists in certain areas such as: fibers or hairs or glass. Someone who examines and identifies firearms, weapons, cartridges, bullets, and similar evidence in criminal investigations; and who conducts scientific tests of firearms evidence. Who Does This: A physical scientist or other person with considerable experience and knowledge of about ballistics and firearms. Someone with experience in military operations, tactics, and/or equipment. Who Does This: Anyone who has been in any of the military services. Usually a retired Colonel or General who has no training or experience with law enforcement or forensic science operations and techniques who is only able to interpret events in terms of "how the military would have done this." Someone who attempts to utilize psychological insights to discern general personality and other characteristics of the type of person who committed a crime. 1. Professionally trained psychologists or psychiatrists experienced with criminal behavior. 2. Anyone with a guess. I recommend that you mentally prepare to become an effective witness to help catch the shooter. When you hear a loud sound, don't assume it is just a backfire or firecracker. React immediately and look around -- all around. Keep in mind that it is very difficult to determine the origin of gunshot in an urban environment. Write down what you see. Don't trust your memory alone. If you have a camera or camcorder, use it to record the scene -- all around the scene. If you have a camcorder, set it on a tripod or window ledge and let it run constantly watching an intersection out your window or just your street. If nothing happens, you can just keep rewinding the tape but if you hear that there has been an incident near you, you might just have something valuable on your tape. If you are driving in the area, keep the camcorder or film/digital camera with you at all times. Whenever you see something "interesting," take a picture or two and just hold on to your shots until the next incident.